Some of you are contacting me and asking how to write an IELTS Task 2 band 7 or 8 introduction and conclusion, so I’m going to give you some ideas here. You need to write a minimum total of 250 words, so an easy way to minimise your panic in the IELTS exam when you read the question is to break your essay down into 4 or 5 parts. This will be the introduction, the conclusion and 2 or 3 body paragraphs depending on how quickly your ideas come and how quickly you can write them down. I then suggest you write approximate 50 words for the introduction and 50 for the conclusion. Use any remaining time for the body paragraphs, which must have a total of minimum 150 words. In the introduction you are expected to paraphrase the vocabulary from the question for 2 reasons. 1. If you do not paraphrase the question vocabulary, this vocabulary is removed from the final word count and may leave you to have written fewer than 250 words, which could lead to a penalty and marks being deducted from your final band score. 2. If you paraphrase the question vocabulary, you are also showing the examiner that you have a wide range of lexis and idiomatic phrases, thus boosting your marks in the lexical resource (LR) column. In the introduction, the examiner is also expecting to see your opinion on the question and how you link your ideas from the introduction through to the body paragraphs and finally in the conclusion. For bands 7 and higher, you need to express this using adverbs to emphasise your feelings about the topic. Some students get a bit worried when they see my instruction – use complex sentences. All complex means is use sentences that have at least 2 ideas in them and join these ideas with linking words or phrases. The more complex sentences the examiner can see, the more marks you’ll get, especially if the sentences are grammatically accurate. What does complex grammar mean? Examples of complex grammar are sentences using modals in the past, or future perfect, especially the passive, or future passive infinitives. These will certainly help to improve your marks if you can use them accurately and naturally. 1 Use this expression to introduce the topic of the question – you’ll get marks for using a passive. 2/3/6/7 This is an idiomatic expression and a paraphrase of the question topic. 4 Although is a good word to use to introduce your complex sentence. It is a word that requires two contrasting ideas in the sentence, which are separated by a comma and so can contrast the 2 approaches considered in the question. 6 This half of the sentence addresses the second part of the question concerning other measures. 7 This is complex grammar using a modal in the passive. In the conclusion you summarise the thoughts you have expressed in the rest of the essay and can then express your personal opinion, using ‘I’, or you can express a neutral opinion. In your conclusion to get your band 7 or higher, you need to use the same techniques that you have used in the introduction. 2 Whether is a good word to introduce a complex sentence, needing an opposite idea. Practise all these techniques independently as much as you can, then you will be able to use them successfully in the actual exam. 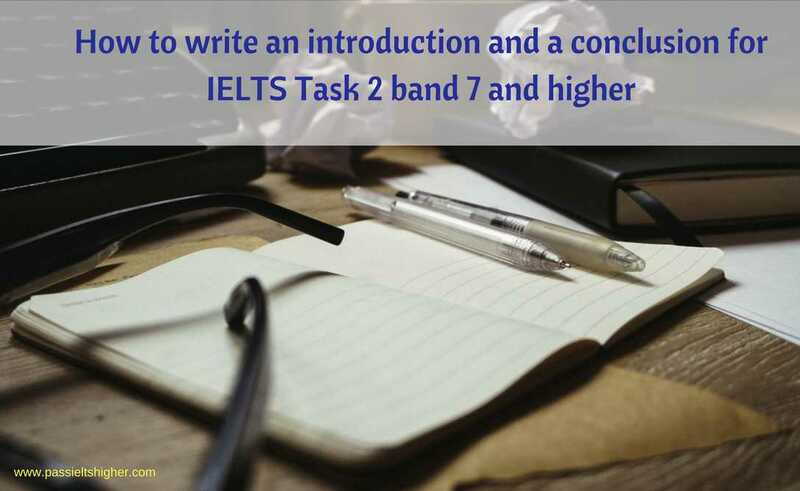 These techniques are essential if you want to achieve IELTS Task 2 band 7 or 8. Thank you for following us, Sonia. I will publish one on the site for you. We are also opening an extension to our members’ area, where you will find more examples. Good luck in the #IELTS exam and let us know how you do. Thank you for following the site, Bindhu. I’m happy that you appreciate our site. Please let us know when you achieve your IELTS qualification with the band you need. Let us know about your IELTS success.